Tweet tweet! 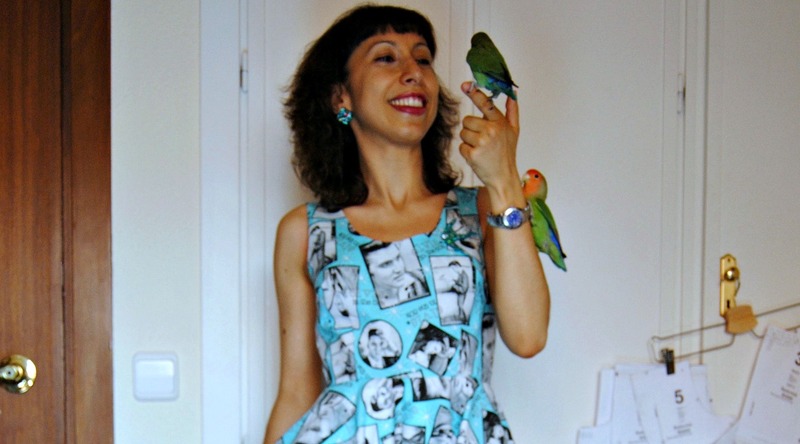 Elena Knits and two of her beautiful lovebirds are here, sharing a very cool vintage reproduction dress. As well as being a fabulous sewer and bird-whisperer, reminiscent of Cinderella dancing away with all the little animals, Elena is also a kickass knitter! First of all I would like to thank Marie for inviting me to participate. My plan was to make this pattern last year, but life got in the way and I had to wait until now. It is a very easy and popular pattern, and the perfect choice if it is your first time making a vintage pattern. It is in fact a vintage reproduction, and has all the advantages of a modern pattern. There are several sizes in each envelope and you can grade between sizes if needed. I had to. I chose size 6 for my bust measurements and graded to an 8 for the waist. I didn't take the hip measurement in account because it's just a circle skirt. My advice would be not to trust the sizing on the package because it has a lot of ease. Measure the pattern pieces and compare it to the final measurements indicated on the pattern. The bodice has a line for petites and I made use of it since I'm just 1.58m. After making a muslin, that adjustment was almost perfect, but then I shortened the back straps by 1.2cm because they were gaping on my shoulders and back. After all that the waist is a tiny bit high (between 0.5 and 1 cm), but I will fix that the next time I make this pattern. I also raised the back neckline and lowered the front because I think it will be more wearable for me this way. I just don't feel very comfortable with very low back necklines. I had a light blue gingham fabric for this pattern but as there are very few lines it is perfect for crazy prints and I finally used my Elvis fabric. Please bear in mind that if your fabric has a directional print the circle skirt will not work and it will be better to make a dirndl skirt. In my case it's quasi directional, but I think it works well anyway. I lined the bodice with the same Elvis fabric to avoid having anything showing on the armscyes and neckline. The skirt is lined with white batiste. I did a narrow hem for the skirt, which I think works fine with circle skirts. I omitted any horsebraid and I'm just wearing it here with a crinoline. This is a very versatile and simple pattern, ideal to showcase a crazy fabric or practice modifying necklines. 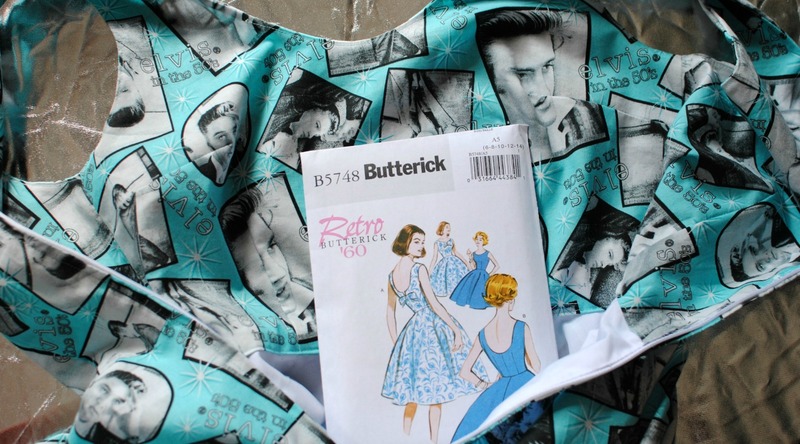 You will be making a vintage pattern with all the benefits of a modern one. This is why this pattern is so popular. And as soon as I have the time I will make another one with the gingham fabric! Love it! This pattern is perfect for showcasing a fun print. Also v impressed with your well behaved co-models! I adore the Elvis fabric!!! It's so bright and cheery for your dress, I'm mad jealous! Cute! I made a muslin and adjustments of this (the split neck view, but also with a raised back neckline), now waiting for it to warm up so I can get sewing! What a lovely dress. That fabric is awesome! I love the style and look of this dress. I also like the higher back neckline adjustment. 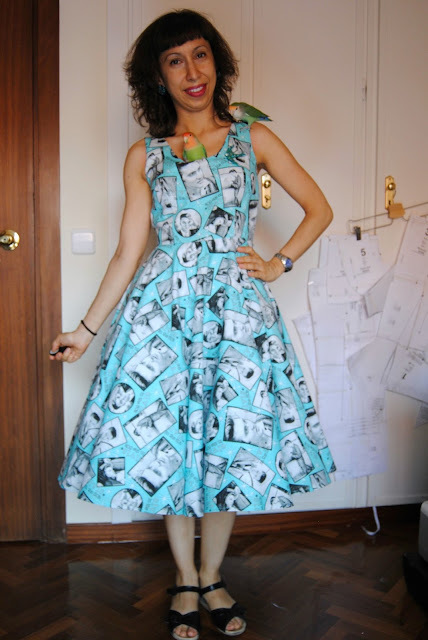 The print certainly makes this dress a statement piece. Nice work.